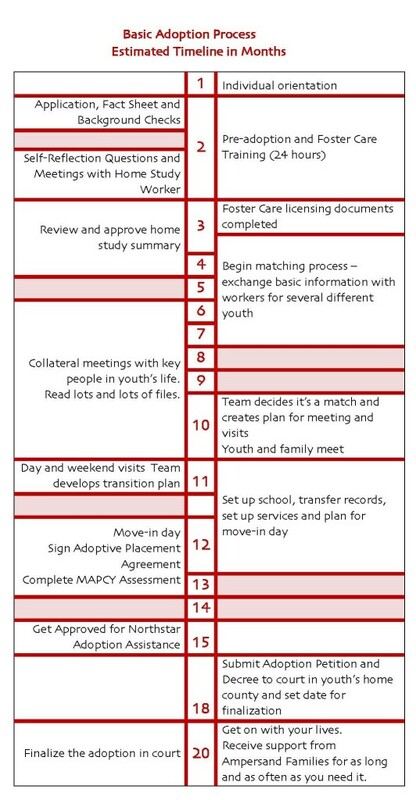 How long does it take to adopt a child or teen from foster care in Minnesota with Ampersand Families? The timeline below lays out the basic steps in the process here at Ampersand Families, and approximately how long each phase in the process takes. Your adoption is just the beginning. At Ampersand Families, we offer support to the families and youth we serve indefinitely. Learn more. We know that going through the process can be frustrating, and can feel like it's taking a very long time. You have our word that we'll move as efficiently as possible, but we won't rush at the times when slow, thoughtful and planful are required. You'll thank us for that later. Promise. Youth don't much like the wait, either. As Amanda told us many years ago, "waiting for a family is like being a puppy in the free box...except when you're a teen, it's like being a big dog with its legs flopping over the sides."